The Second session of the 2019 Indiana Boy’s Basketball State Finals features defending 3A champs Culver Academy Eagles and first time State Finals appearance Silver Creek Dragons. Both teams were feeling each other out during a sloppy first quarter. Neither team shot the ball well but the Dragons did start to show some dominance inside with some offensive rebounding put backs. Second quarter was much of the same with both teams shooting under 30% from the field and less than 45% from the free throw line. Halftime score clearly showed these struggles with a 16-12 Silver Creek lead. Halftime speeches from both coaches had an impact for both teams with the pace and shooting improving for both teams. Silver Creek drained four 3 point buckets in the third quarter with two of the four coming from Joshua Landers off the bench for Silver Creek. And Trey Galloway kept the Eagles close with a few tough three point baskets of his own. Eagles kept their lead going into the final with a 38-32 lead. The final period was back and forth with teams trading baskets each time down the floor. But down the stretch it was the free throw line that kept the Eagles from repeating as Class 3A champions. 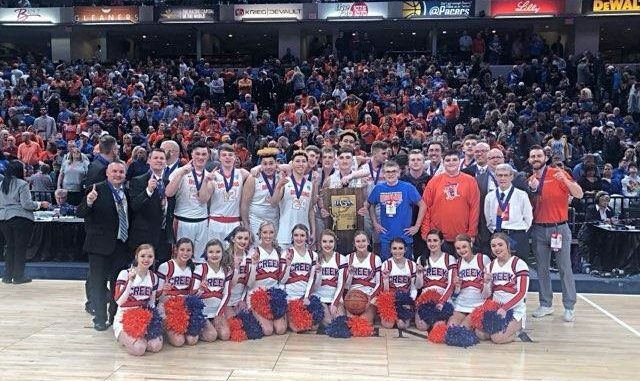 The Silver Creek Dragons outlasted the Eagles to earn the schools first ever State Championship in school history in any sport. Final score was 52-49.